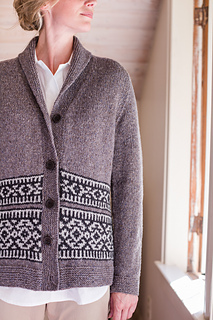 Inspired by the beautiful sweaters designed by the Cowichan knitters of Vancouver Island, Nehalem is a shawl-collared Shelter cardigan with bands of geometric colorwork adorning the lower torso. 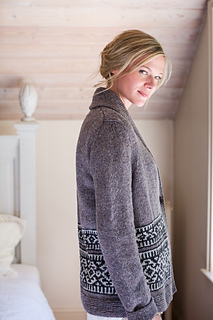 Gentle A-line shaping allows for comfortable layering over fall outfits and the garter-stitch shawl collar, shaped with short rows, folds snugly about the neck. 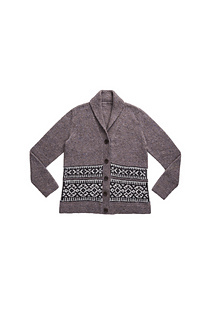 Nehalem is worked with a steek at the center front so you can knit the colorwork in the round. 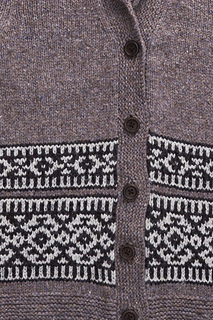 Sleeves are also worked in the round to the underarm; the caps are knit flat and set in. 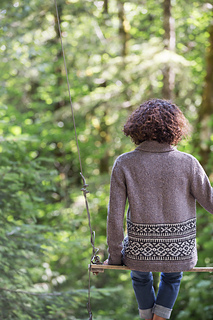 The quiet, monochrome palette we chose nods to the natural sheep shades that characterize Cowichan colorwork, but feel free to knit up a blaze of autumn glory with our red and orange hues. Due to significant variance between knitters, your colorwork fabric should be swatched prior to knitting your sweater to determine whether or not this needle size should be larger, smaller, or equal to Size A. Please read about Speed-Swatching for Circular Knitting (see Special Techniques).